How Much Do Home Rental Prices Surge During Big Events ? This post is adapted from the blog of Datafiniti, a Priceonomics Data Studio customer. Does your company have interesting data? Become a Priceonomics customer. What do you get when the best-in-class in music, film, technology, and interactive media converge on Austin, Texas for a 10-day conference? 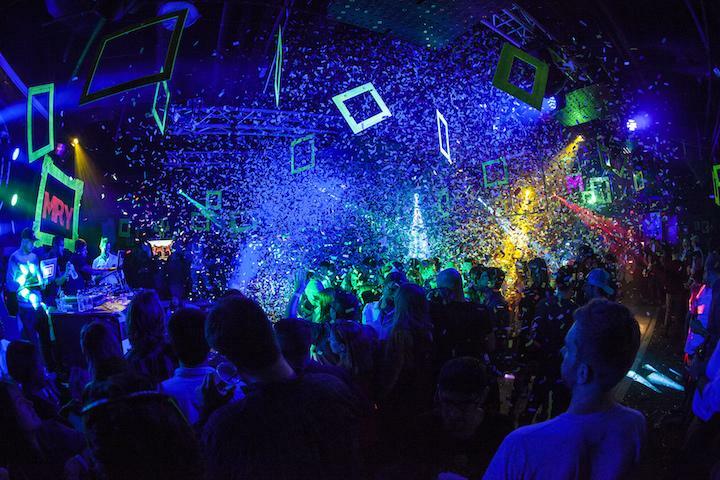 Say hello to the most profitable event for the City of Austin’s hospitality industry, SXSW. Starting in 1987 with just over 700 attendees, it has grown to over 500,000 in 2016. Over the years, the festival has made a name for itself as an industry institution, welcoming guests such as President Obama, Lady Gaga, and Mark Cuban. With an increase in the number of people flocking to a city the cost of travel and a badge alone can cost you a pretty penny. The real challenges, however, are settling on a home base and place to stay. Hotels booked months in advance or with a high price tag open the door for alternative housing options, including short-term rentals such as Airbnb and HomeAway. How much do festivals like SXSW inflate short-term rental prices in Austin? 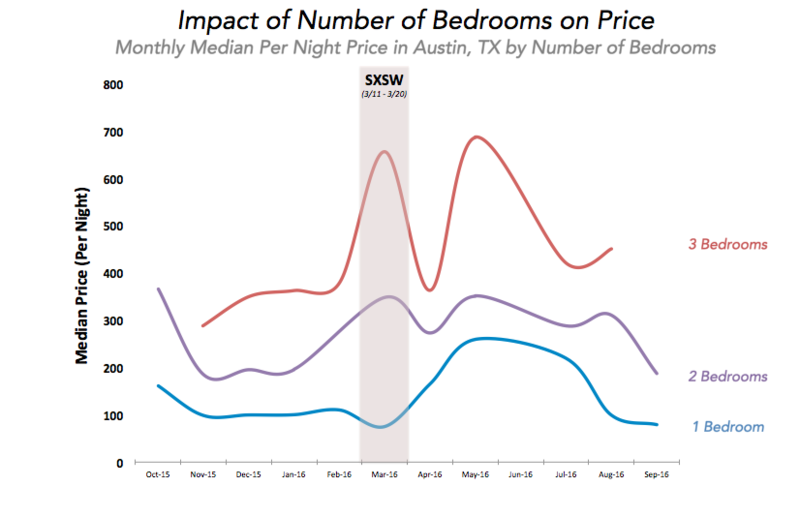 We decided to analyze data from Priceonomics customer Datafiniti, a company that tracks vacation rental listings and prices to see just how much rental prices increased in Austin during SXSW compared to the rest of the year. 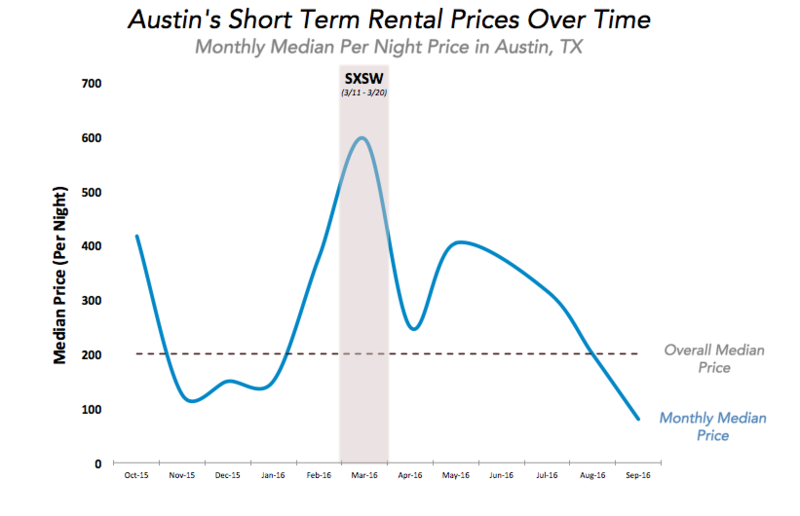 We found that during the month of March, SXSW 2016, the median price per night for a short-term rental in Austin, was three times the yearly median. 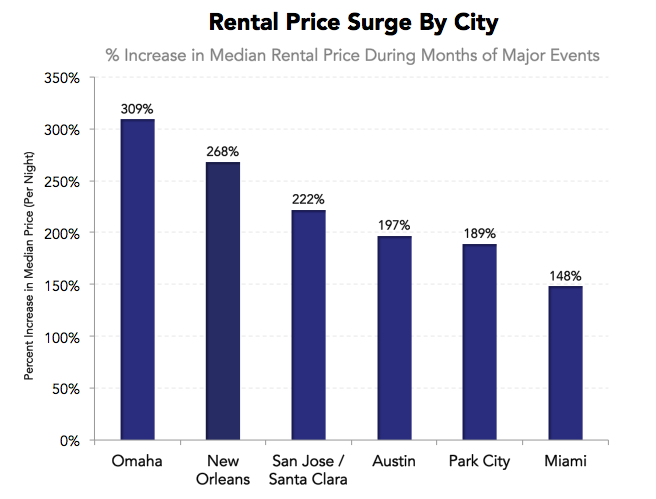 However, this effect of rental prices surging to demand from large events is by no means unique to Austin. It appears that similar effects also take place in other small to mid-sized cities with comparable major annual events including, New Orleans, LA, San Jose, CA, Park City, UT, and Omaha, NE. For our analysis, we wanted to understand Austin in detail. Starting with hundreds of thousands of rental listings, we isolated those for Austin and calculated the median price across all rentals, which was $200. For comparison, we grouped the listings by the month the data was captured to understand the variation. Our data spans a full year, from October 2015 through September 2016. Most notably, we see spikes in October, March, and May. The largest is March, which lines up with SXSW. October plays host to Austin City Limits, and in April and May, there are a series of smaller festivals and concerts, which likely attract enough attention to impact rentals as well. If we break the information down further, we see how price changes with rental features like the number of bedrooms. Viewing the information over time, we can determine if changes correlate with the timing of SXSW. In this case, we see the spikes in price are higher for lodging that includes more bedrooms. This change in pricing makes sense, as demand would most likely be greatest for these larger listings. While a larger residence is more expensive than a single bed rental, most people attend these events as part of a group, with the end benefit being that you can split costs among everyone. For Austin residents, the process of renting out a single bedroom (Type 1 STR) versus a non-owner occupied single-family or duplex (Type 2 STR) is easiest, meaning there is likely an abundance of supply for these smaller rentals. Unfortunately, the city is working towards phasing out Type 2 short-term rentals by 2022. Changes in price are not unique to SXSW and Austin. Sharp increases in rental prices also correspond to large events in cities across the U.S. We explored hundreds of these events to discover which ones have an effect on prices. Below we’ve noted several examples, which we’ll explore further. Using this list, we can explore data in each city to see the exact influence of these events. It’s important to note that some of these cities have multiple small events occur around the same time which drives demand, rather than a singular event. This trend is the case in Omaha, and to some extent in Miami. We see the largest effect on price in the smaller cities, and those with lower median prices the majority of the year. The biggest price increase is in Omaha, NE with 309% more than the yearly median, followed by New Orleans, LA. While New Orleans isn’t a small city, the area most impacted by tourism is only a sliver as compared to the city as a whole. New Orleans’ greater metro area has a population of 1.2 million, but the French Quarter (the main tourism hub) and surrounding neighborhoods have a population of only several thousand. There are a few additional factors that drive costs. First, events that attract attendees from near and far. The Super Bowl is a great example; while hosted in California, most people attending were from Colorado or North Carolina (each team’s home state). Second, the starting price and location of a rental. For example, Park City is a ski area and rentals are generally more expensive. So while the surge price was actually the highest here ($1229 per night), it was only about 200% more than the normal rental cost. Short-term rentals play an indispensable role in events in small to mid-sized cities such as SXSW in Austin. City-wide, Austin’s hotels only have room for about 40,000 people per night, which only serves half the demand during SXSW, according to our previous analysis. So what would the absence of short-term rentals look like in a city that desperately leans on them in peak tourist times? Say goodbye to accessibility (as it relates to accommodations) due to limited hotel capacity. As the demand for alternative travel accommodations grows, the current and available supply may place a bit more strain on your wallet. But just like Batman needs Robin, Austin’s hospitality industry needs short-term rentals. In the case of local tourism, the proof is in the numbers – short-term rentals come to the rescue and make up for what Austin is “short” of during its most jam-packed weeks of the year – room. Note: If you’re a company that wants to work with Priceonomics to turn your data into great stories, learn more about the Priceonomics Data Studio. Top photo from Flickr user Anthony Quintano.